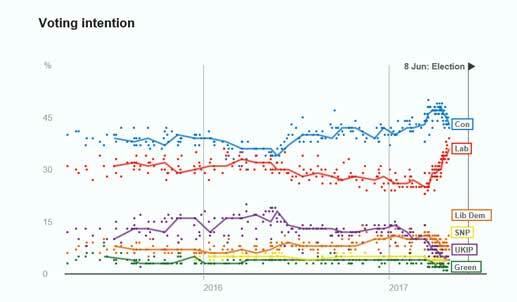 In the run up to the General election, the polling industry has not been successful in communicating the overall reliability of polls to the general public. Professor Patrick Sturgis who chaired the British Polling Council and MRS enquiry into the polls after the last election speaking on Radio 4 on 30 May being a typical example. Sturgis focused on the problems facing pollsters and the detail of what went wrong last time. He failed to point out, in answer to a question about why polling organisations are giving such widely varying leads for the Conservatives at the moment, that the underlying share of votes from all the polling organisations is quite similar, but they are making widely differing assumptions about the level of turnout and its distribution by age when weighting the results. He continued to talk about sampling errors. To view the most recent BBC Poll Tracker used to illustrate this post, click here.